A lame horse is an unhappy one. 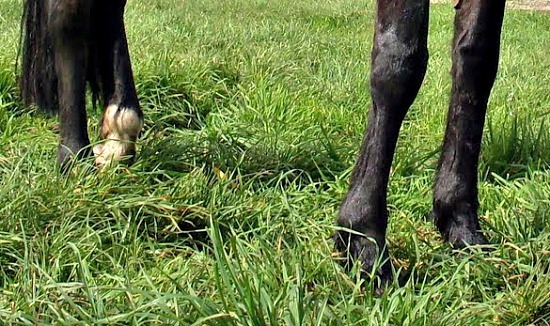 By knowing some of these signs – the horse owner can start the process to recovery. • “Head Bobbing” – When moving, a horse will bob its head downwards at the time of pain. If the front left hoof is injured, the head will “bob” and the horse will compensate in the way it moves its body. • Failure to track up – In theory a horse when moving forwards in trot and walk will step into the track left my the front foot with the back. Failure to do this can show a lameness in the hind. • Sluggish and Unwilling to Move – Sometimes a horse will just be lazy, but it’s important to note that if a horse is normally very active and suddenly appears to be stubborn about performing as usual – a sharp eye should keep watch for further signals. • Improper Stance Depending on the nature of the lameness, a horse will often stand differently then when “sound” simply to compensate for the pain and make itself as comfortable as possible – just as humans do.